Pointed pumps of synthetic leather, made in Greece. The heel is 9 cm .. Pointed pumps made in Greece, of synthetic suede. The heel is 7.5 cm .. 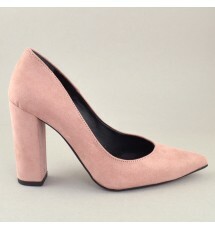 Pointed pumps of synthetic suede. The insole is leather. The heel is square 7 cm .. Pointed pumps of synthetic suede made in Greece. The insole is leather. The heel is square 10 cm.. Pumps of synthetic suede made in Greece. The insole is leather. The heel is 5.5 cm .. 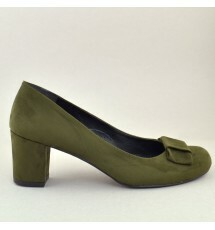 Pointed pumps of synthetic suede with bow at the back. The heel is 10 cm .. Pointed pumps of synthetic suede with ankle bracelet. The heel is 10 cm ..